We all need to know we are not alone in this battle. Sometimes we all need strength and we all have it if we dive deeper in our souls and decide to fight. I would like to thank Rachel @ Rachel’s Random Resources and the author for providing me an opportunity to be part of this tour. Sorry this post is a little late due to hurricane preparation for my family. Liara’s defense of the Wizard Nagarath has rendered Anisthe incantate–bereft of magick–but even this cannot guarantee her safety. Because the death of her father-in-magick would seal the girl’s fate, necessity demands she and her wizard maintain a watchful eye on the war mage, while protecting her from his dark designs. Anisthe has embarked on a journey across Europe, aided by his half-fey manservant with an agenda all his own. They search for a legendary mirror that contains the world’s most powerful magick. Although the stuff of fairytales, the possibility of its existence compels Nagarath and Liara to seek the artifact themselves. Both know that should Anisthe lay claim to that power, Liara would be at his mercy and not even Nagarath could save her. Thus, the pair find themselves at Versailles, surrounded by agents who ferret out magick users and destroy them. Uncertain who is friend and who is foe, with their rival on their heels, they must discover the mirror before Anisthe releases its evil, or worse, it lays claim to Liara’s magick and brings doom upon them all. This was such an unique and fantastic read! It has amazing characters and a plot that will keep you turning pages or scrolling through the night!😍 The only issue is that I wanted more and wished I read the backstory! The storyline was quite compelling and many fantasy lovers alike would fall in love with the world building! A wonderful read, that I highly recommend! M. K. Wiseman has degrees in animation/video and library science – both from the University of Wisconsin-Madison. Today, her office is a clutter of storyboards and half-catalogued collections of too, too many books. (But, really, is there such a thing as too many books?) When she’s not mucking about with stories, she’s off playing brač or lying in a hammock in the backyard of her Cedarburg home that she shares with her endlessly patient husband. Hey guys I am super excited to feature this awesome author/blogger on my blog today! She is such an amazing lady with a sweet presence and beautiful soul. I was so glad I connected with Author Candace Robinson!!! So I am going to shut my babbling mouth up and start this interview because I am so excited to feature her on my blog! Woot! Will you please tell us a little bit about yourself? I’m a writer or at least try to be. I have the tendency to fight with the little demon in my head who constantly tells me that I’m not good enough. Besides that, I live with my husband and daughter who support me through all my insanity. I also have a migraine condition and sometimes they are in the form known as hemiplegic migraines which are utterly debilitating. Can you tell us about one or more of your novels? I wrote Quinsey Wolfe’s Glass Vault back in 2016 and ended up self publishing. After one of my new books, Clouded by Envy, got picked up by The Parliament House, I submitted Quinsey and the sequel to them in which they picked them up. After the new editing process, Quinsey is now how it should have been the first time. It’s full of retellings because I absolutely love them, and I chose the ones that shaped me as I grew up. Other than Quinsey, another of my books that I co-wrote titled Bacon Pie also just released. It has bacon and pie and some romance. Are the characters in your stories that are based off yourself or anyone else? So, I have two manuscripts I just finished that aren’t published and I put a little of myself in there. I sometimes use moments that have happened in my life and sprinkle that in as well. In Hearts Are Like Balloons, the opening chapter about my dad ending his life is the same way it happened to me, except I wasn’t a teen when it occurred. Writing that book helped me get through things a little more easily. What has been the hardest part of becoming/being a published author? Marketing! Also trying to get an agent. I’ve been on a mission for a while now to find one, and I’m hoping eventually one will fall in love with my words. When did you first start writing stories or any other kind of writings? I wrote poems a little after my senior year in high school, but I didn’t actually write anything until I wrote Quinsey in 2016 right after my dad died. I figured life is always unexpected, and you can’t sit there and keep waiting to do something about it. I don’t really have a great answer for that. I just always have little images in my head that are waiting to be pulled together into a story. It knocks, knocks, and knocks some more at my head until they are written down. Did you take writing classes or are you self taught? No writing classes! I’m sure someone would argue that I need to! Lol! Believing that what I’m writing isn’t a big mess. In all honesty, the first draft is most likely always a catastrophe, but then you can go in there and sew it all back together with new words and removing words. Eventually, it all comes together! Reading and taking care of my daughter. She’s a huge Harry Potter fan so I’m pretty sure that makes Harry Potter my hobby! Are there any authors that have inspired your love for writing? I haven’t read a lot of the classics, so it’s mainly YA for me. And that would be Tahereh Mafi and Sarah J. Maas. I just can’t put their books down! What is your favorite book? I know this can be a difficult question for readers! Can you share with us your favorite literary quote? If you could give young writers (who’s dream is to be published) a piece of advice that has anything to do with the writing process, what would that be? Just keep at it. If you want to get published, it is probably going to take a while, but there is someone out there who will love your work. We all just have to find them. My two terrorising, bugar-faced children hold the key to my heart. Writing suspense novels leaves me to feel empowered, grounded, and utterly beside myself all at once. My idea of a perfect evening is to be is standing around a booming campfire, with a cold beer in hand, and in a place where the stars are so bright and beautiful it feels like I can reach up and grab them! I’m a small town girl surrounded by mountain ranges that are to die for. So yes, I totally get to experience this phenomenon often! Are there characters in your stories based off yourself or anyone else? For the most part, no. However, I do have a short story collection that is based on myself, and some elaborated silly memories of my younger years. There are six stories total, and the series is titled Time Wasters. Time management!! Hands down, juggling life as a (excellent) mommy and (incomparable) wife (lol), working part time outside the home and writing full time inside the home. It’s hard not to get a little ran down in finding the time. I’ve definitely learned a thing or two over the last couple of years about prioritizing over stressing. Sometimes you have to take a breath and slow yourself down! Becoming a successful writer is huge, but that can never be accomplished without at least trying to keep your sanity intact. I’ve always dabbled some in poetry, and excelled in creative writing projects up through high school, but it wasn’t until I was in my mid-twenties and going through a bit of medical struggles, that I found my love to create literature. I had to stop drinking, and spent a lot of time on bed-rest… so, naturally I was bored! I decided that I needed a hobby that was constructive, and might help me to feel capable and competent again despite my body’s pitfalls. I turned to writing as an outlet, something to help pull me me away from self-pity and boost my overall health in general. Ultimately, writing turned into a passion much bigger than I’d ever dreamed it could! In a way, you could say writing changed my life. If you wrote an autobiography, what would the title be? I’m completely self taught. Although, I like to think of the novels read as the best teaching tool available to writers. In my opinion, creativity can rarely be taught, and everyday choices in life itself can offer the biggest lessons. You just need to pay attention, open your mind, and allow yourself to learn. What do you enjoy most about being a published author? I love the feedback and the growth in it. I guess you could say the whole process of self-improvement is absolutely addicting! OMG where to start! I probably have too many hobbies, that’s why I’m always strapped for time, and utterly behind on my promised reads and writing projects! I’m very outdoorsy. If it involves fresh open air, the sun and the wilderness, then consider me in! I’m like the most opposite of a ‘city girl’ one can possibly get. Some might even go as far as to call me a redneck… and so be it! That said, I spend a lot of time getting dirty. I hike, ride ATV’s, hunt (my favorite is archery), lots and lots of fishing, swimming/boating. I also love Native American artifacts, so I spend a lot of time looking for arrowheads etc, mostly in desert ranges. I also LOVE to take the time teaching my kids dance, sports, and music! Every single book I’ve ever read has inspired me in one way or another. I pick up on the qualities I love, and I take note of what I don’t. BUT, if I have to pick just one author then I’m going with Colleen Hoover. Not only because her writing is absolutely amazing, but because she’s a beautiful person in general. She’s a giver, an absolute inspiration in every way. She donates and raises money for charities often, and is a pillar of the community. I actually got to interview her for The Conscious Talk Magazine and it was absolutely a dream come true! Take your time, and take breaks before you do any rounds of edits and revisions. Once you’ve stepped away from a project for a while, you’ll come back with a clean slate and a fresh perspective. Overall this will help your piece to be better rounded and prettier polished. Growing up in a small town had more than several advantages and disadvantages. Saying that my childhood was sheltered is nothing short of an understatement. Unlocked doors, cleared streets, and the quiet of a trustworthy neighborhood were all welcomed features of my hometown. As a small child I baked cookies with the old lady down the road. I sat next to my kindergarten crush in sun day school, and literally rode my bike in the middle of the road without a care in the world. We didn’t have what kids have today. We actually had to use our imaginations to have a good time. There were no smart phones, tablets, or 64s to keep us occupied. We were perfectly content to play with our stick guns and a water hose for hours on end… And I loved it! Along with my scrapes and bruises I also maintained a simple, happy for the little things attitude, and of course a great tan. Now that I have made my childhood out to be nothing but cherries and smiles, I have to point out the disadvantages that came with the small town upbringing– before the world of electronics took over the young mind. One word distinctively comes to mind… Boredom! As I grew into adolescence I no longer cared much for silly toys, dancing, baking, or crafts. I rebelled like many young adults do. With a sever chip on my shoulder and a lack of coordination in the sports department, I spent the majority of my time partying. Nothing too outrageous, mostly close friends, fires, and beer. As much as I would love to say that living in a small town gave me an overactive imagination and love for books, that is unfortunately not the case. I cared more about having a good time than I did about school. I was voted wild child twice in high school. I cheated my way to passing grades. It wasn’t until I was settled and married with a child on the way that I found my love for the literary world. Rearing out of my mid twenties left me a bit more mature, having to find more important things to do with my time than re-occurring nights at the bar. This is when it started – I read one book after another for a few short years, then decided to give writing a bash. I’m completely amazed at the love I developed! Once I started putting the world of imagination that has long been trapped in my overactive mind into a keyboard, the transformation of self began. A new aspiration in life has formed. I want nothing more than to be known as the unexpected novelist who took the literary world by storm! My novels include three stand alone thrillers, Search For Maylee, Aggravated Momentum, and The Stix. I’ve released the start to a YA dystopian trilogy New Age Lamians (books 2 and 3 are intended to be released in 2018). I also have a few short story anthologies, Time Wasters, and The Suspenseful Collectionpartnered with Kim Knight. One of Didi’s quotes which she likes to share on her Bookstagram! Thanks so much everyone for stopping by and reading my interview with the lovely Didi Oviatt!😀📚 Until next time, lovelies!Xoxoxo! First love. A promise of forever. A lie that changes everything. Backpacking with her high school friends, Erica Lindell’s life takes a thrilling new turn. Meeting the fascinating Sasha Ailes, she can’t help but fall completely and irrevocably in love with him. When he feels the same way about her, Erica finds herself drawn into a fairytale love story that will set her life on a new direction. But Sasha has kept his true identity a secret. Finding out who he really is, Erica must overcome the betrayal and make the hardest choice of her life. Can she give up her own dreams to live in his world, or leave and lose him forever? First Came Forever is an enchanting, heart-wrenching story about finding true love and the devastating consequences it can lead to. What price is too high to pay, even for love? I grew up in Stockholm, Sweden, but I’ve spent a lot of time in the USA and UK. Currently I am partly living in the US, dividing my time between Stockholm and New York. Reading has always been a big part of my life, I love to read and travel through books! My favorite genre is definitely YA, both contemporary and fantasy. Besides books I also love music, theatre, dance, art and movies; anything that brings magic to your life, really. And I love to run, so I’m spending quite a lot of time with my running shoes on. Can you tell us about your new novel, First Came Forever? 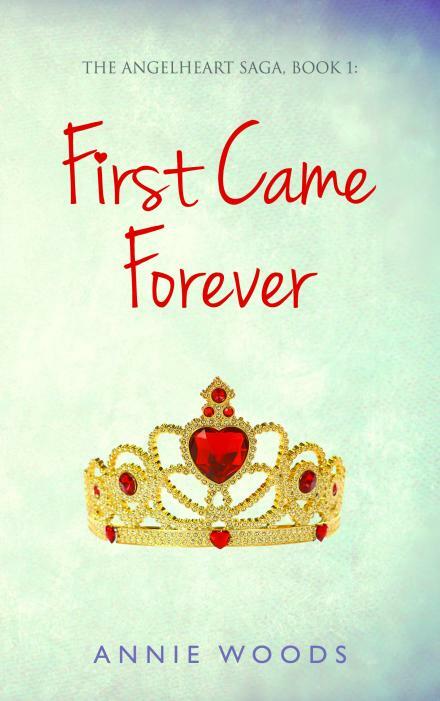 First Came Forever is my first novel and it means so much to me! It’s the first book in The Angelheart Saga trilogy following 18-year-old Erica Lindell as an unexpected meeting changes her life forever. It’s a story I’ve been carrying with me for years. The image of Erica and how she moved to US for love came to me on a vacation in California over four years ago. Driving along Highway 1 the plot and the other characters crystalized; how she meets Sasha and falls heads over heels in love with him, but how difficult even such a strong love can be when reality hits with their different worlds and the mixed feelings for Tyler that intrudes Erica’s mind. On the plane back home I started writing this book. Then it was the song Moonlight by Stevie Nicks that gave me the final direction for the book, and the courage to start writing it. When I learned about how the song is a combination of Stevie’s own personal relationship and the love story between Bella and Edward in Twilight it just hit me how to get the story I’ve had in my head for so long together. That it should focus on something both ancient and up to today. So, my book is a love story of the same kind as Bella and Edward’s, but instead of a vampire tale, it’s a conventional kingdom and its old-fashioned rules that forces Erica to decide what is worth giving up for love. I think that First Came Forever is a lot about finding your directions in life. To find out who you are and feel comfortable in your skin. To stay true to yourself and make your own decisions no matter how hard they are. Are the characters in your story based off yourself or anyone else? Yes, I have to admit that Erica is very much based off myself. Erica is just a tiny bit (oh, alright, A LOT!) smarter and better looking and with way more integrity. But, just like me, she’s clumsy, a bookworm, too serious for her own good at times, a kind of bad driver, but a great runner finding peace and quiet and respite from all demands out in the woods with her running shoes on. But Tyler on the other hand was not based off any person, he was just supposed to be this secondary character, the stereotype High School bad boy/jock that was not meant to play such an important role in the story at all. But when I started writing the book that changed completely. Or rather, he worked his magic on me… He really made me so interested and intrigued that I just wrote more and more about him, so in a way Tyler created his own character.Also, most of the places described in the book are based off my own experiences. I’ve been to all places described myself, and I really love Cambodia and Vietnam, which I hope shows in the book. There have been so many positive reviews on First Came Forever and everyone I know (including me) loves the story. Did this positive feedback take you by surprise? Were you nervous about the publishing process? Oh my gosh, I was so nervous! Having your book published is like sending your child off to school for the first time. I’ve been living with the characters in the book for years now, so I actually think about them as real-life-persons, like my children or old friends that I wish the very best for. So it was so devastatingly nervous to have the book published and wait for the readers’ reactions, hoping that they would love Erica, Sasha, Tyler and all the others just as much as I do. But it’s such an amazing thing to share your story with others, and getting positive feedback is just magic! I love the bookworm community and all the wonderful contacts; I’ve gotten so much love and support and encouragement, it’s just unbelievable! (This is also the reason why I started my “Sunday spotlight”-series on my blog, where I try to share and return some of all that love and support I’ve received by shining some light on an amazing blogger, bookstagrammer or other lovely book community person every Sunday.) And I’ve really found some amazing friends, found some true kindred spirits, like you, Dani! I can honestly say that getting to know you is one of the absolute highlights of having my book published! How long has it been since you first started writing and created your own stories? In a way the answer could be “always”, or at least as long as I have been able to write… When I learned to read a whole new world opened up to me. I can still remember the feeling of being blown away. So, reading has always been a big part of my life, and soon (I think already in first or second grade) I started to write my own stories. But I never thought I could be a writer, so I went on to study other things and pursued another career, and never really did a serious attempt to write. I guess I didn’t believe enough in the story or in myself… So First Came Forever is basically the first fiction I’ve written. When this story came to me, I felt that it was so strong that I just couldn’t let it go but had to try and write it down. Who inspired you to become an author? I really have to say thanks to my parents for opening up my eyes to the wonderful world of books, by giving me books at an early age and by always coming along to all bookstores I dragged them to. In school I also had some wonderful teachers who encouraged me a lot. And then there was my grandmother who was a painter, but who’d never dared to follow her dream and instead only painted ”for fun” at home, who taught me the importance of being brave enough to pursue your dreams. But I’m a late bloomer, so it took me quite a long time to really do that… I guess that you could say that it was the story itself that inspired me to dare to write it down! The feeling when I held the first copy of the book in my hand was so overwhelming, I can’t even try to put it into words. I wish so much that I could go back in time and tell the younger me to believe in myself and pursue my dream to write much sooner, not to wait this long to do it. I think that the hardest thing is to deal with a writer’s block. I’ve had a few of those, but I try not to worry too much about it (easier said than done though…) and allows myself to take a break from writing when I feel a block coming up. Instead I try to get some new inspiration from reading books and watching movies. And I also use running as a way to clear my head and get new inspiration. Another hard part in writing a sequel, when so many have loved the first book, is that you are afraid to disappoint the readers. It was so much harder writing the second book than the first one, I have really struggled with writer’s blocks and anxiety this time. Oh, yes, there are so many amazing authors out there! I love YA authors like Rainbow Rowell, Marie Lu, Cassandra Clare, E. Lockhart, contemporary authors like Maggie O’Farrell, Curtis Sittenfield, Nobel prize winners like Toni Morrisson, Nadine Gordimer, Doris Lessing… And an all time favorite is Joyce Carol Oates. I also have to mention Stephenie Meyer, since the Twilight series was the series that really opened up my eyes for the YA genre, even though I’m not sure that I would love the series quite as much if I reread it now. Right now the two books on the top of my mind is The Gentleman’s Guide To Vice And Virtue by Mackenzi Lee and Carry On by Rainbow Rowell; I’m so in love with these books and the characters! But if I have to choose one “life-time” favorite book, it would have to be the Harry Potter series. To me, those books are pure book perfection! The way J.K. Rowling has created a whole universe on her own and all the characters that you love and carry with you in your heart forever. With Harry Potter, J.K. Rowling has also helped so many troubled and lonely children, giving them hope and bringing them joy, it’s utterly amazing. There’s even a research study proving that the Harry Potter books help children to be more accepting of LGBT persons, so the books are literally making the world a better place. The best advice I can give is to believe in yourself and never give up on your dream! And to just get into the habit of writing, a little bit every day. It’s really the hard work and actually putting the words in your head down on the paper that makes you a writer. Writing down the initial concept is so much fun, then after that it is basically just a lot of hard work… But just keep in mind the story you want to tell, and that you will get to share it with others when the book comes out, and it will be so worth it all! Hey guys! I have missed you these last few days! I am going to be trying to catch up with everything and everybody because I miss all of your lovely face! I hated being away from the blogoshpere while being with my family at the hospital but things have stabalized finally and I am able to start catching up with everyone’s post and all my reviews within the next few days. But enough about me!! I want to show off my current read that is so AWESOME and today is the book’s birthday! Yay! I want to give lots of thanks to Kensington Books to providing me with an ARC of this book! I get to color and read it! Two of my faves wrapped in one! So I will get to the best part, let’s hear about this book! Includes A Front and Back Cover for You to Color! Download the PDF and start coloring today. By day, Florrie Fox manages Color Me Read bookstore in Georgetown, Washington D.C. By night, she creates her own intricately detailed coloring books for adults, filling the pages with objects that catch her eye. There’s plenty of inspiration in her new apartment—a beautiful carriage house belonging to Professor John Maxwell, Florrie’s boss. He offers the property to Florrie rent-free with one condition—she must move in immediately to prevent his covetous sister and nephew from trying to claim it. When the professor’s nephew, Delbert, arrives, he proves just as sketchy as Florrie feared. But the following morning, Delbert has vanished. It’s not until she visits the third floor of the store that Florrie makes a tragic discovery—there’s a trap door in the landing, and a dead Delbert inside. The esteemed Professor Maxwell is an obvious suspect, but Florrie is certain this case isn’t so black and white. Doodling clues, she begins to consider other colorful characters on the scene, all with a motive for murder. With a killer drawing closer, Florrie will need to think outside the lines . . . before death makes his mark again. Krista Davis is the New York Times bestselling author of the Domestic Diva Mysteries and the Paws & Claws Mysteries. Several of her books have been nominated for the Agatha Award. Krista lives in the Blue Ridge Mountains of Virginia with two cats and a brood of dogs. Her friends and family complain about being guinea pigs for her recipes, but she notices they keep coming back for more. Please visit her at kristadavis.com.